Our article „Certification of MOOCs – Advantages, Challenges and Practical Experiences“ got published originally in Spanish language with the title „La certificación de los MOOC. Ventajas, desafíos y experiencias prácticas“ as part of the journal Revista española de pedagogía. In general, participants use MOOCs for individual learning purposes by selecting certain contents of a MOOC in which they are interested. Simultaneously, MOOCs are used in the context of online-lectures offered to students who must or may enroll for a specific course to earn credits. However, many participants do not successfully complete all units of a MOOC. Therefore, completion rates – in general – are rather low. Certificates like PDF-documents or electronic badges can be an adequate stimulation to complete a course. This research raises the questions, how the certification of MOOC-participants can be managed and if certificates have an impact on completion rates. Firstly, general aspects of certification are discussed. This is followed by a practical insight into the certification practice based on experiences of the Austrian MOOC-platform iMooX operators. As a conclusion, results are summarized and related challenges and further research questions are addressed. Our last publication at this year European MOOC Stakeholder Summit 2016 in Graz about „How to integrate and automatically issue Open Badges in MOOC platforms“ is now online available. Though MOOC platforms offer quite good online learning opportunities, thereby gained skills and knowledge is not recognized appropriately. Also, they fail in main-taining the initial learner’s motivation to complete the course. Mozilla’s Open Badges, which are digital artifacts with embedded meta-data, could help to solve these problems. An Open Badge contains, beside its visual component, data to trustworthy verify its receipt. In addition, badges of different granularity cannot just certify successful course completion, but also help to steer the learning process of learners through formative feedback during the course. Therefore, a web application was developed that enabled iMooX to issue Open Badges for formative feedback as well as summative evaluation. A course about Open Educa-tional Resources served as prototype evaluation, which confirmed its aptitude to be also used in other courses. Today the EMOOCs conference is starting – for sure it will be a great event. 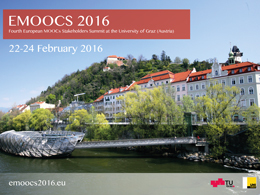 If you did not find time to visit us, you can follow the twitter stream with the hashtag #emoocs2016. The whole conference proceeding is already available on ResearchGate. Der Online-Kurs zu Open Educational Resources auf iMooX ist vorbei. Danke an alle die bis zum Schluss mitgemacht haben. Wie versprochen gibt es diesesmal nicht nur Teilnahmebestätigungen sondern zertifizierte Badges. Zertifiziert heißt, dass diese Badges nur Gültigkeit haben für eine E-Mail-Adresse und zwar jene die man bei iMooX verwendet. Man kann sie dann herunterladen und z.B. bei Mozilla BackPack hochladen in sein Portfolio (hier sind z.B. meine) Achja, wie kommt man zu den Badges? Ganz einfach, einfach im eingeloggten Zustand bei iMooX auf „Meine Badges“ klicken, danach suchen wir ob für die Benutzerin oder den Benutzer Badges vorhanden sind und zeigen diese an. Wie es genau geht haben wir versucht in diesem Film nochmals zu beschreiben.